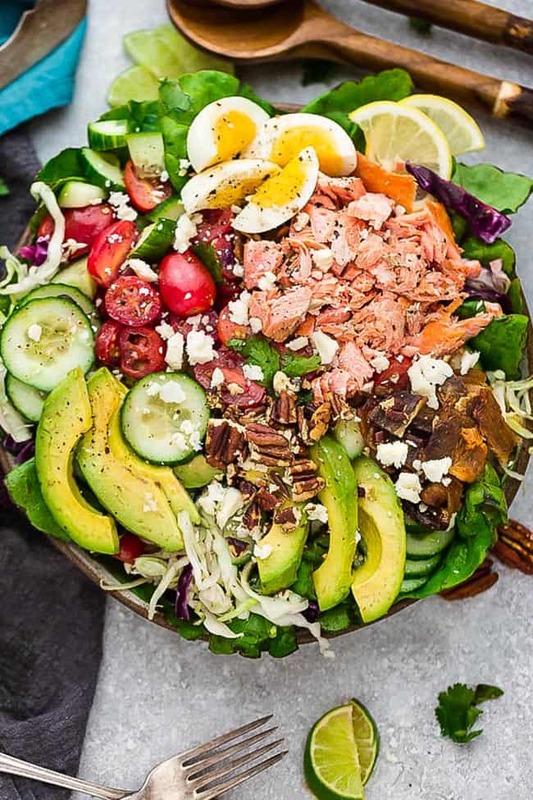 Salmon Cobb Salad is a lightened up twist on the classic Cobb Salad. It’s made with grilled or broiled salmon, cucumber, eggs, tomatoes, avocado, crispy bacon and a creamy and tangy vinaigrette. Low carb, keto , gluten free with Whole 30 & paleo friendly options. Loaded salads are my favorite thing to have for lunch or dinner when the weather is a bazillion degrees outside. 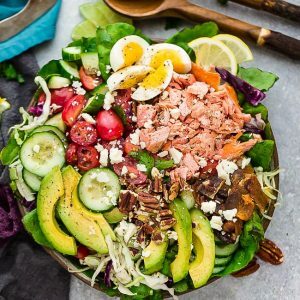 I love a good Cobb Salad since they are a great keto-friendly option when you’re dining out. 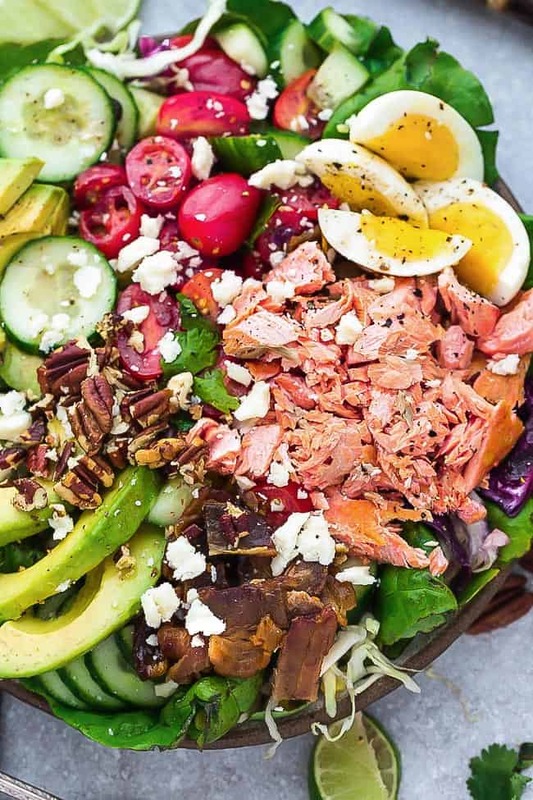 This Salmon Cobb Salad has all the components from my favorite Chicken Cobb Salad except we swapped the classic chicken with some healthy salmon – mixed greens, Canadian bacon, hard boiled eggs, cherry tomatoes, cucumbers and avocado. And if you want a little bit of a crunch – feel free to add some chopped pecans or any other nuts you like. Salmon happens to be my favorite fish because it’s a delicious choice when you’re craving something lighter. Plus it takes no time at all to cook and is packed with protein and healthy Omega’3 fatty acids. WHAT OTHER DRESSINGS ARE GOOD WITH COBB SALAD? 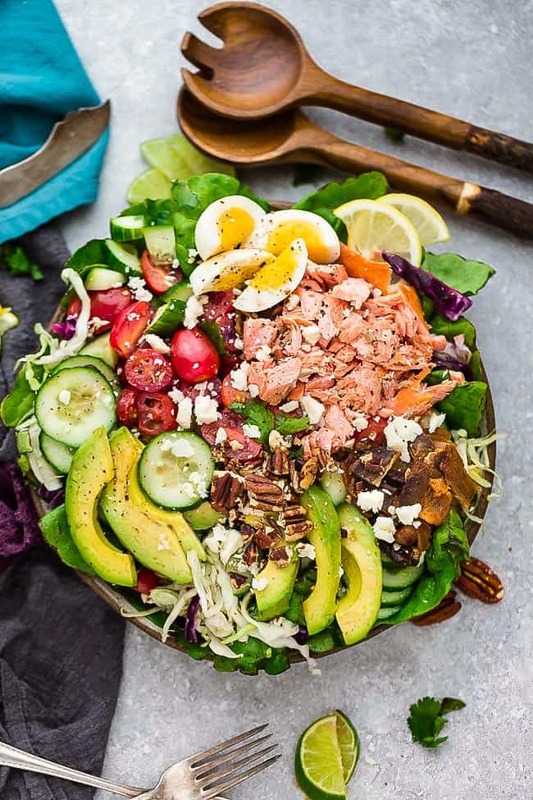 Cobb salads are so versatile and depending on what you like or have on hand, they would be great with some creamy ranch, Caesar, Poppyseed or even a balsamic vinaigrette.